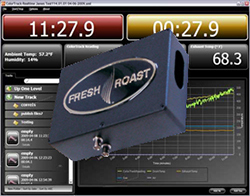 Consisting of the most advanced development since computer controlled roasting profiles, we proudly offer the ColorTrack and its accompanying software, ColorTrack Realtime. 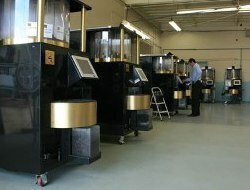 This computer controlled java gem, inspired by Silicon Valley technology, is the first major advance in coffee roasting in more than 100 years. Fresh Roast Systems has been a fabulous tool for Larry’s Markets. It enables us to roast all our blends to our customer specifications. Training the employees on it has been very easy. FRS has assisted us in all the steps. It’s really as easy as using an ATM machine and takes very little time. All of our associates are trained in all five stores and they find the system very simple. The Fresh Roast Systems Ventless Coffee Roaster is a new generation of technology that turns operators into professional roastmasters with the push of a button.